^ Steinberg, Jonathan. Bismarck: A Life. : 51. ISBN 9780199782529. ^ 2.0 2.1 Lowe, Charles. Prince Bismarck: An Historical Biography With Two Portraits. Kessinger Publishing. 2005: 538. ISBN 9781419180033. ^ Steinberg, 2011, p. 87-89. Eyck, Erich. (1964). Bismarck and the German Empire. New York: W. W. Norton & Company. Hiss, O.C. (1931) Bismarck: Laws and Sausages. Berlin: Sans Souci Press. Stern, Fritz. (1977). 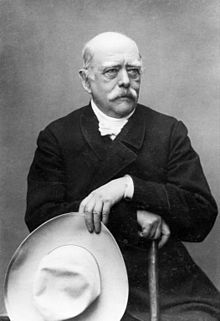 Gold and Iron: Bismarck, Bleichröder and the Building of the German Empire. Harmondsworth: Penguin. Taylor, A.J.P. (1955). Bismarck: the Man and the Statesman. London: Hamish Hamilton.